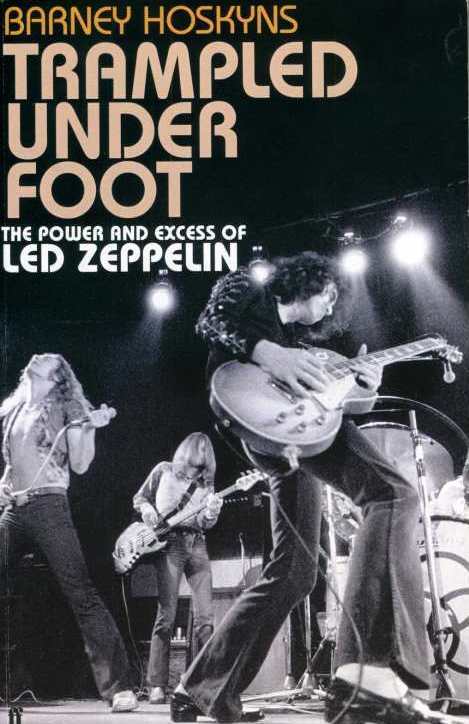 Faber has set a September 6 release date for the "Trampled Under Foot: The Power And Excess Of Led Zeppelin" book by British music critic Barney Hoskyns. The 624-page book is described as follows: "A unique look at the history, adventures, myths and realities of this most legendary and powerful of bands, it is a labor of love based on hours of first-hand and original interviews. What emerges is a compelling portrait of the four musicians themselves, as well as a fresh insight into the close-knit entourage that protected them, from Peter Grant to Richard Cole to Ahmet Ertegun, giant figures from the long-vanished world of 1970s rock. Featuring many rare and never-before-seen photographs, it is also the first book on Led Zeppelin to cover such recent events as their triumphant 2007 O2 Arena gig and Robert Plant's Grammy-winning resurgence of recent years." In a recent interview with Metro.co.uk, Hoskyns stated about "Trampled Under Foot", "Most [existing Led Zeppelin books] recycle tales of groupies and mudsharks and chucking TV sets out of windows. For me, this is terribly boring. I wanted to demystify the band but, at the same time, I uncovered stuff that's even more shocking. Zeppelin were the biggest band on Earth in the 1970s and were a law unto themselves. They drove through red lights in limousines, there were many brutish incidents of physical violence. Any mess was cleaned up very efficiently." He added, "[I interviewed] nearly 200 people [for the book] and I had earlier interviews with [Jimmy] Page, Robert Plant and [John Paul Jones] in the bank. The sheer number of interviews persuaded me to repurpose it as an oral history, without an overarching narrator." For the better part of a decade, Led Zeppelin was the greatest group on the planet, eclipsing records set by Elvis and the Beatles. Artistically and financially, they were the apex of the genus Hard Rock in all its glory. Barney Hoskyns meticulously tracked down everyone involved with the band during its early years, at the height of its power, and during its dramatic decline. This is the inside story of what went on behind the music, lifting the lid on the parties, the fights, and the unmitigated, unapologetic bad behaviour of rock gods at the pinnacle of world stardom.